Fabric Mart is celebrating 35 years of business. We were in business when bellbottoms were popular and people danced the night away at Studio 54. We've been through the crazy 80s with acid washed denim, big hair and loose sweaters to our knees. And the 90s styles of plaid flannel shirts and penny loafers. The 21st century rolled around and we stayed up to pace with it! We launched our website while keeping in the fashions of preppy polos, peacoats and ponchos. We've changed our business structure as much as fashion has changed. Robert Richin, owner of Fabric Mart, started the business in 1977 at a store front in Manheim, PA. Today we house thousands of different fabrics in our warehouse and retail store in Sinking Spring, PA, just 30 miles away from the original storefront. We've gone from being solely a retail store, seven franchises, back to one retail store with expansion on wholesale fabrics and developement of a retail website. All of this would not be possible without the 17 full and part-time employees we have today. 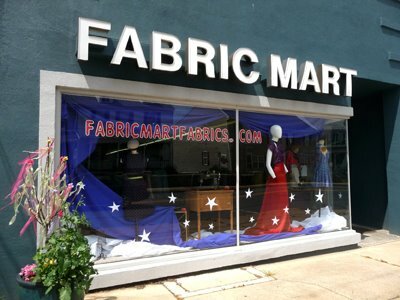 Throughout this summer, you will get an inside look at Fabric Mart and how the business comes together because of its employees. Don't worry, we're going to be adding a lot of fun things (tutorials, tips and tricks, inspiration, etc.) in between the "history" so be sure to stop back often to see what's going on. The blog is run by five women ages 20-45 all with various sewing skills--beginner sewers to intermediate seamstresses. We all have different positions at Fabric Mart, but share the same love of fabric. 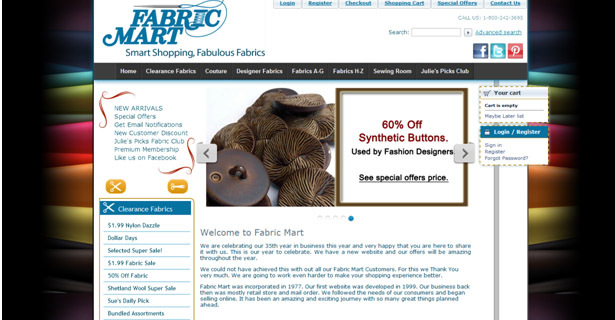 That's why we're calling ourselves the Fabric Mart Fabricnistas! We hope you enjoy following our blog!